Successfully Added Digital Handheld Wind Speed Meter Anemometer (Beaufort Scale, Air Velocity, Temperature) to your Shopping Cart. Digital Handheld Wind Speed Meter Anemometer: The easiest, most convenient, and most accurate way to measure wind speed. Do you enjoy sailing, surfing, kite flying or hunting? Or maybe you're a science teacher or meteorologist tracking weather patterns? If so then I’m sure you’ll agree that knowing the exact wind conditions and wind speed plays a critical role in your sport or occupation. That’s why this handy digital handheld wind speed meter or “anemometer” is an essential tool that makes your life much, much easier. 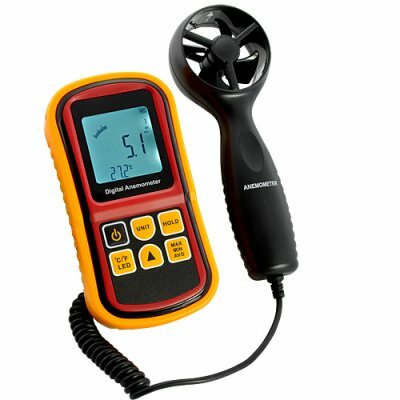 This high quality anemometer reports the current air velocity in either miles per hour, kilometers per hour, meters per second, or Knots plus, and displays them clearly on the LCD screen. It also shows the current temperature (in Fahrenheit or Celsius), the Beaufort scale number, as well as the min/max/avg air velocity measurements. The LCD screen even has a backlight, making the display easy to read even in dark and low-light conditions. For sailors, surfers, hang-gliders, or kite-fliers, this nifty gadget is a must-have for keeping tabs on current wind conditions. Order now at our factory direct OEM price and you can spend less time worrying about wind conditions and more time safely enjoying your sport. You’ll be much happier you did. This wholesale anemometer is covered by a one-year warranty and is in stock now and ready for express delivery. Battery included, ready to use out of the box!